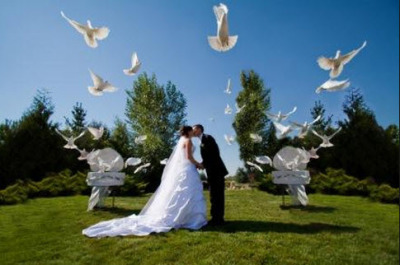 Celebration Doves can create a dramatic ending to your ceremony that your guests will be talking about for a long time. Your event will stand out among others with this unique added touch! Dove releases are often accompanied with music, or preceded by poems and readings performed by those at the event. A white dove release symbolizes peace, serenity and new beginnings. You may also choose to display a pair of our pure white birds in a decorative cage during the ceremony and/or reception representing the bride and groom as they begin their life's journey together in purity and devotion. Your guests will be in awe of the incredible beauty of our birds as they make their way out of their release baskets, circle spectacularly overhead and return to their loft at home. Your white dove release will be one of the most memorable events of the wedding day, yet one of the least expensive! Make your reservation today and create a memory that will last a lifetime! 50% non-refundable deposit due at reservation with remaining due two weeks prior to the event. Your date will be reserved with a contract negotiated at the time of deposit. Please feel free to contact us for additional details or with any questions. Upon request, we can provide references of past customers. 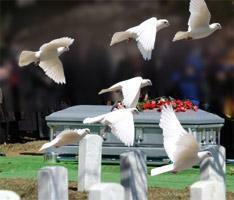 For many the white dove represents your loved ones spirit when released at the graveside service. 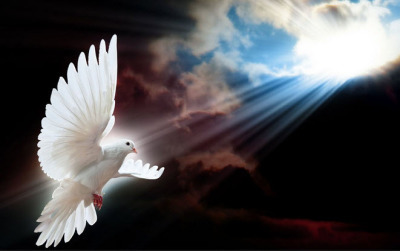 The release of white doves offers a powerful healing effect and sense of closure which may provide a spiritual and emotional release for those who are grieving. At the end of the graveside service, family members release the doves from a beautifully decorated basket. The release may be preceded by music or the reading of a suitable poem. The flock then soars into the sky and circles the area awaiting the spirit of the loved one to join them before returning home. We are sensitive to those coping with the loss of a loved one and appreciate the hurried planning of a funeral. We are available to provide our service with short notice. Prices begin at $225.00 for the delivery and release of 1-4 birds. Please contact us for details.